The current path I walk. The shadows are getting longer, but the trees are still green. 2016 is a year of movement and action, but mostly it’s been a year of work. I cannot count how many pagans have told me that they have had significant amounts of work come up that they were forced to do. But the work hasn’t been all that bad. Most of the work that I have heard about has resulted in significant growth that pays big dividends. It’s been a pretty good year overall, but everyone I talk to is pretty tired! Today as I did my daily walk, I noticed that the leaves in the trees haven’t started to change yet. This was really odd to me, as last year I was commenting that the leaves were mostly changed by mid-August. Now here it is, mid-September, and there is barely any color. Summer is officially over up here. Today we got our first colder morning. I wore a jacket into work today for the first time, and my husbands last open water swimming race was this past weekend. Yet most fall projects aren’t quite starting up yet. It’s a perfect time to take a little bit of time to rest. Now I’m not certain how long this rest period will last. Perhaps tomorrow the trees of the nature path I walk will be awash with colors, and possibly signify that the break is over. But if you are like me, you are going to take what you can get to be able to go into the last months of this year of action with as much energy as possible. This one really bugs me. I spend some time each month doing intuitive tarot readings at my local pagan store, so I have a vested interest in this issue. Yes, I understand that there is a large piece of society that still thinks Tarot is a fun game, and I’m OK with that. In fact, I’ve frequently given readings at parties where most people did think it was all in fun. But there are other people that truly believe (and truly receive) guidance from these readings. Readings can be fun, be someone serious, or extremely serious. When the spirits want to, they can cause laughing fits to the point where my client and I are both in tears. They can also be so serious that it feels like all of the air was pulled out of the room. I’ve had clients storm out of the store because they were so mad at seeing the same guidance over and over, and I’ve had some in tears because they have given a piece of information that the client desperately needed. Overall, everyone that has gotten a reading from me has gotten something they needed out of it. I give pricing at the beginning of the reading, and that price doesn’t waver, no matter how many questions they ask about the cards they see on the table. I also have an extensive list of ethics that I hold myself to when I give readings. Talk with the reader first, get the fees up front. The fees shouldn’t change in the middle of a reading. If they do, there is a problem. Ask how long they have been reading professionally. Although not always a good indicator, this at least gives you a feel for who it is you are dealing with and how much confidence they have. See if you can get some sort of referral from a past client. If the reading is at a pagan store, talk to the store owner and get information about how the readers are selected. After all – it’s the store’s reputation on the line as well! If at any time you start feeling pressured to purchase more time or purchase a trinket or token, take that as a possible warning. I also teach Reiki, but I refuse to set up Reiki classes while I am doing readings. Instead, I give the client my number and have them call me later. It allows the client to not feel pressured (they don’t have to call) and allows them time to think about whether or not the training is right for them. If you don’t feel fully satisfied with a reading, don’t go back. Seriously. I would much rather you find someone that meets your needs better than I could. Take over promising as a warning. Sorry, as much as I would LOVE to give you those winning lottery numbers, or make you come into money in some form or fashion, that’s just not in my wheelhouse during a reading. Readers should be honest in what they can and cannot do. If you get uncomfortable answering the reader’s questions, or are uncomfortable at the probing the reader is doing, feel free to stop the reading. Remember, this reading is for YOU. If a client wants to tell me more about a situation after I’ve already confirmed the reading brings it up, that’s fine. But if a client doesn’t want to go into detail about a medical issue, or a problem in a relationship, that is perfectly acceptable. Most readers are very good at what they do, and like me, they have a passion for it. But like many other things, psychic readings in any format are ripe with scams. The noted points above will help keep you safe and allow your reading to have a better chance of being a positive experience. If you ever have a question about etiquette during a reading or just want more information about my readings, feel free to ask! This past weekend I kept some walk in hours at my local pagan shop giving Intuitive readings. It was a busy day, and I found many of the readings I gave were very intense. Intense readings meant my clients were getting some good information. However, throughout the day I noticed that there was an underlying theme of the readings. The theme was that this year is going to be a year of getting things done. I am not talking things coming into fruition, I am talking that this is the year of getting your hands dirty – of learning new skills, changing habits and of learning to step out of the comfort of what we know and move into the unknown. Usually when I get an underlying theme like this, it isn’t just coincidence. Instead, it is a message for anyone willing to heed it. Right now is a time for work, And for all of the work that is put into this current cycle there will be many benefits and rewards that will make all of the effort worth it. Of course work is hard. But there are ways to make it easier. Approaching it with a positive attitude goes a long way toward making work easier. Not overdoing the load and giving yourself time to get comfortable with new patterns is another thing. In my own personal life I have already started to see rewards manifest from the work I have put into this year. I feel better, more connected to the spirits around me and am all around happier in my life. I feel more like myself than I have in a long time; like I am welcoming an old friend back that I have not seen in many years. I don’t know if these feelings will continue as I work, but I am thankful for them now. My plan is to work on different things each month, this month it is getting a habit of regular offerings to my ancestors and to the Gods and Goddesses that I currently am working with. I am not certain what next month’s goals will bring. Perhaps I may start writing more detailed posts about my magical work, I don’t know. But for now, I recognize I am doing my work and I am very happy about it. The next few weeks are going to see some big changes. I can already feel the energy starting to build. Normally, I am not one for making New Year resolutions, but I think this year I might. If there is already energy building, why not take advantage of it? That is, if I can figure out how. Eight of swords, usually the significator position. I don’t use the significator much because I feel this position talks to the energy of the client at this very moment. All I got out of this card is that I am stuck, not by my own choosing, but at the same time it is. What’s funny is that I am reminded of Skye/Daisy’s transformation on Agents of Shield. The organic growth that this card is showing the woman stuck in. Perhaps that is the transformation starting? Crossing me, the Hermit. I am bidding on a position at work that would put me into a position of sort of a consultant. There is only one person for an entire side of our development process, and that would be this role. So I see work and the bid is crossing me right now. The past, the Tower. I feel like this goes back two years, when I was diagnosed with Fibromyalgia and Chronic Fatigue Syndrome. My whole life came crashing down. But perhaps that was part of this entire plan. The future, six of wands. To be honest, I have no idea what to make of this card being there. Ideas taking flight, images of plans moving forward? I don’t know. My fears, the seven of pentacles reversed. I don’t normally read reversed, but this time it feels like I should. I have done a significant amount of work to get me where I am, and I am afraid of it all wilting quickly. My hopes and dreams, three of swords. This one I have no idea again. It showed up reversed, but it doesn’t feel right. How others see me, Queen of Wands. This is a big thing, as my normal identified significator is the Queen of Pentacles. Perhaps this is a sign of a significant change in my identity? How I see myself, four of swords. This is definitely different than the Queen in the previous card. Perhaps I still have self image and perception work to do. Environment, six of swords. Again, I have no idea what to make of this card. Final outcome, Death. Well, I guess no matter what is going on and what changes are going to be coming, they are inevitable. This reading bugs me. First, because I can read cards so much better than this, and second, because I hate not knowing where it is I am moving toward. I like plans, I like processes that are spelled out. I don’t like unknowns. But perhaps that is what I am supposed to get used to, the unknown. How do you prepare for that? I know that is the point, you don’t prepare, but how do you prepare for that again? Can’t tell I am a Taurus, can you? Author KarleshaPosted on December 13, 2015 June 9, 2016 Categories Divination, Magick Work to doTags belief, divination, heathen, pagan, paganism, tarot, Wicca, Wiccan, witchLeave a comment on Moving Forward, maybe. When someone asks me for an intuitive or tarot reading, I feel honored. Someone is asking for me to give them insight into their life, and that is serious business. Even the ones that come in for the fun of it realize that divination can bring good insight and information. Therefore it is my job (and my honor) to give them the most accurate reading I can. When I first started giving readings roughly 20 years ago, there weren’t many people that had a set of ethical guidelines that they followed. But over the years I realized one was necessary, so I came up with my own set of guidelines that I follow for each and every reading. I take this stuff very seriously, and I hope other readers do the same. A lot of the readings I have done over the years involved very personal circumstances. While the reading itself may not pick out specifics, the client many times will volunteer further information when they realize what it is I am talking about. Once the client starts to recognize the reader understands the situation, they relax. Many times, that means the lines of “reader/client” relationships starts to blur into to one where two friends are discussing a problem. In those cases, we become trusted advisers and counselors. It is for this very reason that I keep all readings confidential.This is also why I try to speak in a lower tone while doing readings in public. It may mean that I have to respectfully ask another potential client to wait deeper in the store or somewhere away from the area I am reading. It also means I have to respectfully bypass any questions by anyone else other than the client. In those cases, keeping business cards available or asking a friend to keep your appointments during public reading sessions is a good idea. Any prospective clients eyeing you will recognize the level of professionalism you bring to your work, and that you truly care about your clients.One disclaimer here – Should the client openly speak about committing actions that are clearly against the law, the reader should report these actions to the authorities. In most states, rules of confidentially only apply to licensed clergy, doctor/patient privilege, spousal privilege and attorney/client privilege. Should the reader keep serious crimes they are aware of their clients committing (or considering committing) to themselves, it could be considered bad karma, and in rare cases, the reader could be subject to prosecution. For those of us with legal clergy licenses, it is something that you also could be bound to do, depending on the oaths you took regarding your specific clergy designation. In smaller communities it is very common to read the same person multiple times. It might be hard, but it is very important to go into readings with repeat clients in a non-biased manner. If the reader comes into the reading remembering the previous month’s reading with the client, they may miss something new and important that is happening now. Circumstances change frequently and unless the reader is aware of every moment of the client’s life between readings, it is very hard to connect one reading with another.In smaller communities it is also easy to overhear gossip about other people. We are human, and whether or not we participate in that gossip, having it in the back of your mind when you do a reading for someone whose issues are well known can also cause bias. It is very important that should the reader be aware of possible situations that they try to be as unbiased as possible. This may mean that the reader has to excuse themselves instead of possibly giving a biased reading. I would much rather do that than to try and push it with someone I have strong feelings toward, or if I know something about a question than to deal with the karma (or the client’s patrons/guardians/spirit friends!) that a biased reading would cause. At least once every other month I get a request from a client that wants to “test” me. This person may not believe in divination, or was ‘put up’ to getting one from their friends as a joke. Or, someone might be testing my ability before they recommend me to a friend. In every one of these cases it is very important that the reader treats the clients with the same respect as they would treat someone that is taking the reading very seriously. There have been many times I have turned skeptics into believers because of my professional attitude and accuracy.Does this mean that all readings must be done with the utmost seriousness? Not really. Humor has its place in readings too. However, being humorous should not also mean being disrespectful to the client, their guides, your guides, the tools and gifts you have and the Gods and Goddesses in a reading. This is BIG TIME important. As a medical intuitive, I have on occasion gotten information about medical issues my clients are having. But I fully recognize I am not a trained nurse or doctor. Therefore if I am seeing someone having a medical issue, I will phrase it as “have you talked to your doctor about…. ?” If they have not spoken to their doctor, I tell them the indicator that I am seeing, the level of intensity that I see it at, and suggest that it might be something they look into. I NEVER, EVER try to diagnose something. It’s not my place, and I don’t want to be liable.If a mental health indicator comes up repeatedly, or if I recognize a possible mental health issue (a field where I do have training), I might GENTLY suggest to the client discussion with a licensed mental health professional. This is an area where you have to be very careful. No one is going to be happy with you if you tell them that they are crazy and need professional help! Instead, you could mention that speaking to a professional might alleviate some stress or pent up energy that they have regarding a specific issue.Another disclaimer – if someone is threatening to hurt someone else or themselves, take it seriously and report it. You don’t have to let the client know you are doing it. Just get as much information as you can, and report it to the proper authorities after the reading is completed. This was SO HARD for me to learn. Most readers have an empathic nature, if they are not a full blown empath themselves. So when serious issues come up during readings, it’s hard not to internalize problems. We want the best for our clients. Therefore it’s hard not to get upset when something comes up. But the reader has to do everything that they can to release that energy. This has serious consequences for the reader, especially if it is allowed to build. Regular spiritual cleansings, taking breaks between readings and letting go all of the information about the reading after it is over are all good ways to release that energy. The reader should also recognize their own endurance here. If I am constantly giving readings for several hours, I know I am going to need significant time the next day to rest and recharge. I have seen this come up a couple of different ways. First, I’ve had clients whose energy reads like a black hole – there ain’t NOTHING coming out of the cards, nor is there any energy coming from the client. A second way is that I feel like I didn’t properly communicate the information or a concern that I was trying to explain to the client. In both of those cases, I need to trust my guides and my gifts to do the reading and accept what is happening. It’s happening that way for a reason. I have to pull my feelings out of it and do my absolute best. That is all I can do. Finally, I might be reading for a child, a person who speaks broken English or an older client that only accepts Christianity as their true religion. In those cases I do my best to use terminology that I know the client understands. I know I need patience, and I also may need to explain the same information in multiple ways using different terminology. As well as adhering to those guidelines, I also try to present myself in a professional manner. I dress comfortably, but in a more formal manner, as I would for a day at the office. I also try to wear clothes that are lighter in color. So that’s my list! It has changed just a little bit over time. I’m happy to know that there are tarot organizations out there that have guidelines similar now, but I still think these fit for the experiences I have had over the years. Every month I spend a couple hours giving readings at a local pagan shop. This is something that is very enjoyable for me. Not only do I feel I help others, I feel like with each reading I also learn something new about myself. I am always amazed at some of the people that come in for readings. Of course I get many of the general questions from clients; relationship stuff, finding mister/miss right, when they are going to come into money, stuff like that. But there are also many times I get someone that has something going on in their life and are trying to hear a different answer than what they are getting. One mundane example was when a woman came to me who was trying to decide whether or not to leave her husband. The husband had been sleeping with the woman’s best friend for several years, and he and the best friend had been open about it. This continued to occur even though the marriage was supposed to be monogamous. The cards told me this woman was being stepped on and put through hell, and I told her so. 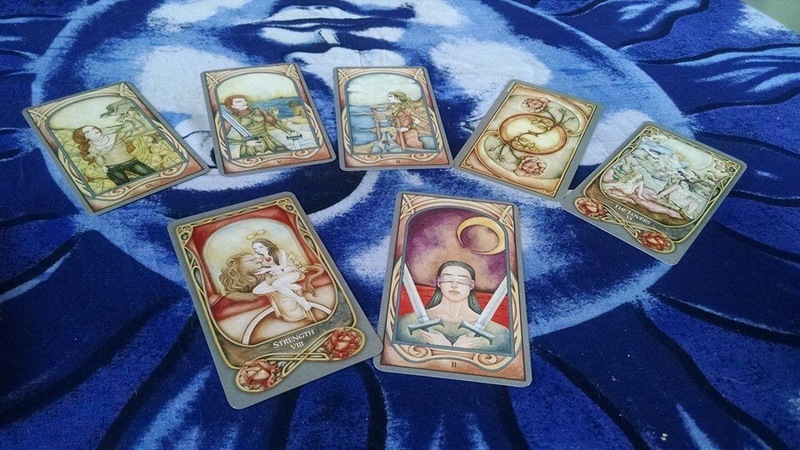 But even though she confirmed what the cards said and shared stories of things she had gone through with me, by the end of the reading she was of the mindset that she just didn’t have enough information to make the decision, and thus was going to consult with other readers. Basically, she didn’t like what she was hearing. This happens a lot. One tarot deck I have has a very ‘no holds barred’ style to it. 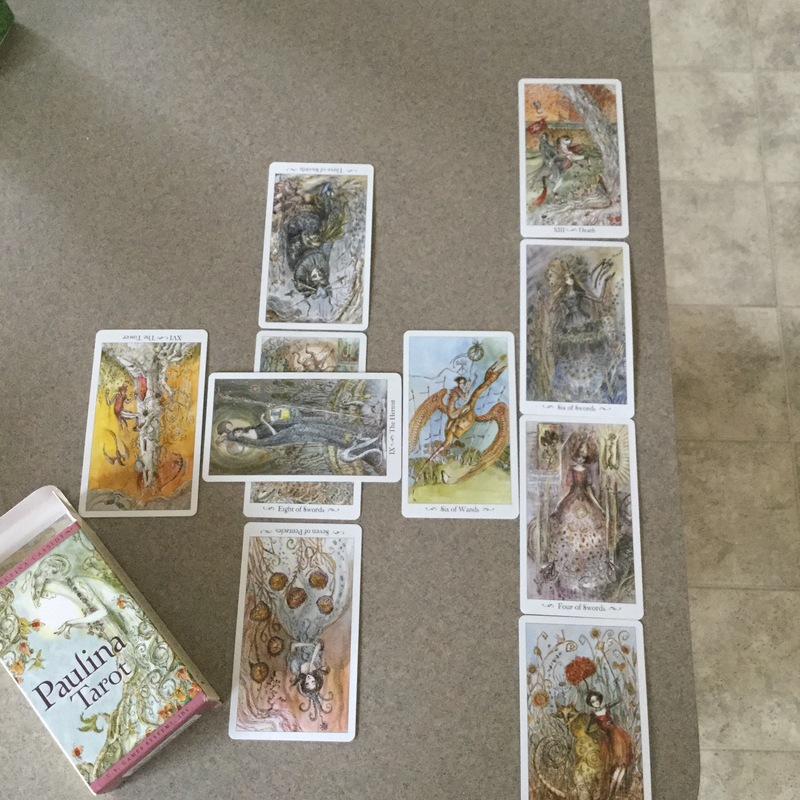 I had a client ask specifically for that deck to be used in her reading. By the end of the session she was so mad that she could barely speak. I don’t know if it was at me or at the friend sitting next to her saying “I told you so!” throughout the reading. Yet again, the client was getting the answers she needed to hear and act on, but since they were not the ones she wanted, she got mad instead of listening. There could be many reasons for this. Many times a reading will pull out details that make people uncomfortable, or the answers to the questions that are asked will push the querent into a situation that is outside of their comfort zone. But what the querent has to realize is that the answers and information is there for a reason. The Gods are asking you to grow, or else you wouldn’t be in the situation in the first place. It is our nature on this planet to deal with these scenarios over and over again in order to transcend the problem. We must grow and push ourselves through these issues, for if we do not, we become stagnant and wither. I know acting on things isn’t easy. And at least for me, sometimes I have to be put in the situation several times before I fully grasp what it is I have to learn. That is ok. We wouldn’t be human if we got things right 100% of the time. And it’s OK to be upset about answers that aren’t what you want them to be. Just don’t get mad at the messenger.